Posted September 14, 2016 by Ian McArdell & filed under Books. Charming his way through Blake’s 7’s four year run, Paul Darrow’s Avon was the grinning anti-hero we loved to hate; reluctantly taking on the ruthless Federation as he pursued his primary agenda of looking after number one. Though public schooling, with a controversial quest for glory in the Combined Cadet Force chronicled, young Paul followed a path which took him to RADA. Failing on his first audition, but impressing enough on a repeat attempt, his time there is fondly recalled, as are the stints in regional rep that followed. Playing the lead role of Alfie on stage, it was a lengthy unscripted interaction with a grieving audience member which opened the doors to television, the first of which was a role on medical drama Emergency Ward 10. A host of television roles followed; after Blake’s 7 he worked with John Thaw in Drake’s Venture, who proffered good advice on how to handle the press, and gained expert golf tuition at the licence payer’s expense. More recently, he has appeared in both Emmerdale and Law and Order: UK. It is clear that Darrow holds his four years of space adventure with much affection; learning the hard way not to do his own stunts and revelling in the development of Avon’s killer attitude. While he firmly credits Terry Nation for the show’s success, as well as inspiring a whole host of shows that followed in its wake, there are plenty of kind words for many of the cast and crew too, including script editor Chris Boucher and stalwart director Vere Lorrimer. Darrow spends some time contrasting Blake’s 7 with its stablemate Doctor Who, noting some cast crossovers and recalling his famous note from Who producer JN-T to reign in his rather over-the-top performance in ‘Timelash’, where Darrow had decided to channel Richard III. The Blake’s 7 section concludes with a personal episode guide, which Darrow calls “a preposterous series of misadventures”, and this serves as a hilarious vehicle for further anecdotes from both on and off screen, as well as some musings on the stories themselves. Warm and witty, it is clear that Paul Darrow is worlds away from the ruthless character he made famous. Far from a tell-all autobiography, this book reveals an enthusiast for his craft; an actor who is both grateful for his successes and wise enough to recognise the doors that Avon has opened, and continues to open for him. As much as he tries to follow chronologically through his career, there is an insight into the actor’s life as various co-stars and directors link stage projects and television shows, so that moments in the tale come around more than once. At times this perhaps feels a little muddled, though we chose to take in the style of a colourful raconteur. 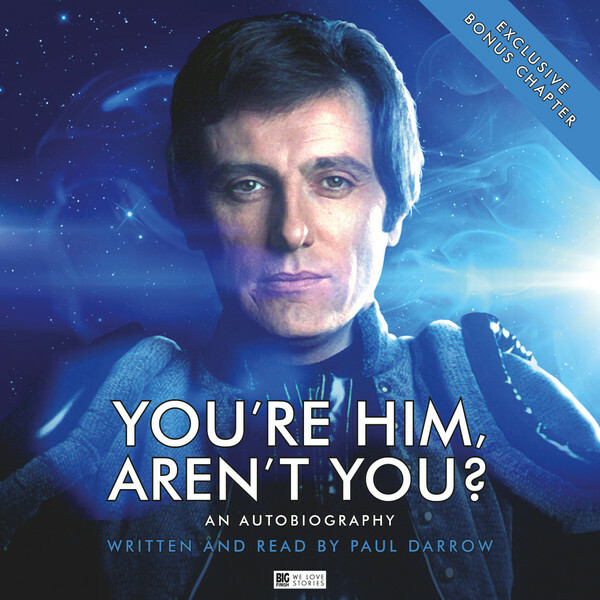 Paul Darrow seems the ideal dinner party companion, best served with good food and fine wines! Failing that, we can heartily recommend his story which, with tongue firmly in cheek, plus a liberal sprinkling of famous names and self-deprecation, is guaranteed to entertain. Released in August 2016 by Big Finish Productions. Follow Ian McArdell on Twitter.